Create your own custom graphic window shades! 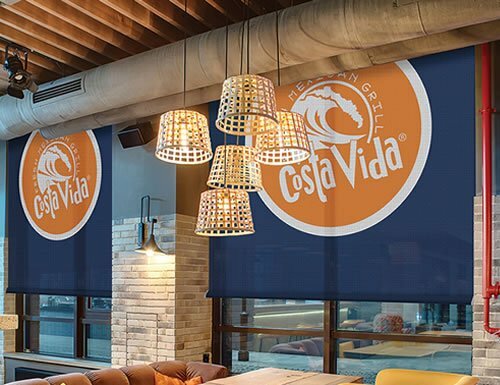 Add any custom logo or graphic to our roller shades. Whether you want a custom graphic window shade with your logo for your business or a scenic shade created from your own photo we can print your image on the window shades. Standard roller shade fabric is light filtering with optional upgrades to blackout or screen fabrics. Select the "custom image" as the color of your shades as well as the size, fabric and other options. Because the shades are custom made we can print any color background for the shades. Purchase shade. Pay for your custom logo blinds using our checkout or phone order. Contact customer service to design your custom printed window shades. You will need to email us a digital copy of the graphic or corporate logo you wish to use. We cannot print any copyrighted graphics without proper permission. Note: There may be additional design fees if Blind Chalet needs to manipulate your art work. If you have questions on the specs give us a call. Approve the proof we will send you of how the shades will look once completed. After the proof has been approved we will begin production on your shades. Note: This approval process adds about 1 week to our standard lead time of 2-3 weeks. W: 12" 13" 14" 15" 16" 17" 18" 19" 20" 21" 22" 23" 24" 25" 26" 27" 28" 29" 30" 31" 32" 33" 34" 35" 36" 37" 38" 39" 40" 41" 42" 43" 44" 45" 46" 47" 48" 49" 50" 51" 52" 53" 54" 55" 56" 57" 58" 59" 60" 61" 62" 63" 64" 65" 66" 67" 68" 69" 70" 71" 72" 73" 74" 75" 76" 77" 78" 79" 80" 81" 82" 83" 84" 85" 86" 87" 88" 89" 90" 91" 92" 93" 94" 95" 96" 97" 98" 99" 100" 101" 102" 103" 104" 105" 106" 107" 108" 109" 110" 111" 112" 0/0"1/8"1/4"3/8"1/2"5/8"3/4"7/8" H: 12" 13" 14" 15" 16" 17" 18" 19" 20" 21" 22" 23" 24" 25" 26" 27" 28" 29" 30" 31" 32" 33" 34" 35" 36" 37" 38" 39" 40" 41" 42" 43" 44" 45" 46" 47" 48" 49" 50" 51" 52" 53" 54" 55" 56" 57" 58" 59" 60" 61" 62" 63" 64" 65" 66" 67" 68" 69" 70" 71" 72" 73" 74" 75" 76" 77" 78" 79" 80" 81" 82" 83" 84" 85" 86" 87" 88" 89" 90" 91" 92" 93" 94" 95" 96" 97" 98" 99" 100" 101" 102" 103" 104" 105" 106" 107" 108" 109" 110" 111" 112" 113" 114" 115" 116" 117" 118" 119" 120" 0/0"1/8"1/4"3/8"1/2"5/8"3/4"7/8"
This is the second custom shade I ordered. This is the second custom shade I ordered. I love them both, and the company. Excellent customer service and design assistance. I found the ordering process could be more clear and information could be more clear and consistent. I found the ordering process could be more clear and information could be more clear and consistent. Not all of the options I'd chosen were listed on the order confirmation but, after discussion with the customer service representative over the phone, I did receive what I wanted, although it was never fully detailed in the paperwork. The hardware and fabric both appear to be solid and durable, installation was straight forward and I expect to be using these for may years into the future. I've received many compliments on the high quality of the photo printing. I thought that 2-sided printing was an option but learned from customer service that it isn't. These blinds are AMAZING! Completely transformed the outside look of my business. The people were amazing to work with! We just received the three custom blinds we ordered. We just received the three custom blinds we ordered. The logo and color are spot on! We can't wait to put them up! Thank you! I was blown away by this product. I was blown away by this product. The quality of the printing was over the top and outstanding. Absolutely no pixelization and the size of each blind was 71x71. Their price was far better than any of the local shops I tried. The customer service was pretty good too, I always got an email reply within a day. My photos were very high resolution black and white artistic shots of classic cars and the photos faced inward to turn windows into artwork. The blinds not only prevent heat, but also protect my collectibles from uv, and are as centerpiece to the room's decor. Designed to allow light to pass through the shades while blocking most of the UV rays. Our 5% openness screen fabric is a non-privacy fabric. Our standard fabric is a light filtering fabric. Upgrade to blackout fabric to block light from passing through the window shades.